“Prayers and condolences,” and “thoughts and prayers” were offered up almost immediately after news broke that a gunman had opened fire at a Broward County high school on Wednesday. Prayers were offered as the shooting unfolded, even before the gunman was apprehended; before it was confirmed that 17 high schoolers were murdered at Marjory Stoneman Douglas High School. Prayers and thoughts and condolences are by now the mechanical response to mass shootings; rote in their expression of sympathy, empty in their concern. These expressions are the now standard response to mass shootings, and another expression has joined the chorus of responses. “I’m with WPBF 25 News... Can we and ABC News have permission to use across our platforms/partners? Are you available for a phone interview?” a journalist tweeted at Aiden Minoff, a 14-year-old Douglas freshman who was tweeting photographs from inside a locked classroom. The now-viral photograph was taken while Aiden was waiting for the shooting to end. From the perspective of the classroom floor where he was sitting—ostensibly hiding—as Nikolas Cruz killed his schoolmates, it showed a standard South Florida classroom: glossy vinyl flooring littered with backpacks and crumbs, the chrome legs of chairs and desks, two shoes, including Aiden’s black sneakers, jutting into the frame. “Still locked in,” Aiden wrote. The replies to his tweet are filled with journalists asking whether or not they could use Aidan’s photograph across platforms, from television to print to digital. From ABC to CNN and CBS, as well as a range of local media outlets. Some call him “Adrian,” while others reassure critics that they were chatting with him over DM, worried about his safety. And that may be true; perhaps they were concerned for the safety of a teenager trapped in a classroom at what would become one of the deadliest school shootings in America. Surely the journalist tasked with asking a teenager to reuse his content would say that is their job, the 21st-century version of waiting outside of a hospital, asking a victim’s family for comment. No doubt that’s true. But even so, such responses treat the crush for “content” and the transformation of that photograph into “content” as a kind of natural occurrence. That stories must be made and reported is inevitable—but its very inevitability and subsequent transformation into content to feed the news cycle replaces even the basest expression of empathy with the making of spectacle. On the local news in South Florida where I live (just a few minutes south of Douglas), nightly sitcoms were preempted for live coverage of the shooting. Each channel played a Snapchat clip seemingly without ceasing while simultaneously apologizing for its violent and shocking content. The video, taken by a Douglas student, shows students sitting a floor; shots ring out in quick succession as students scream and yell and curse. The video shakes. Each station, both local and national, censored the cursing of terrified teenagers, too much reality, apparently, for the nightly news. As the video played on loop last night, and anchors apologized, offering up warnings on the video, helicopters circled overhead. ﻿Helplessness is the ultimate tabula rasa. I imagine that the standard defense of using such videos is that they tell us something about school shootings. That they transform an abstract idea of terror and fear and death into something tangible while sanitizing the bloody reality of such chaos. Maybe that’s true; maybe after nearly two decades since Columbine, there are people who lack such basic imagination or empathy that they can’t conjure up the knowledge that mass shootings are terrifying. That seems lacking in not only imagination but the simple demands of humanity—a Washington Post report found that, since Columbine, more than 150,000 students have endured a school shooting. Despair takes on some of the other’s suffering to no purpose. Indignation demands action. We try to emerge from the moment [...] back into our lives. As we do, the contrast is such that the resumption of our lives appears to be a hopelessly inadequate response to what we have just seen. For Berger, the only possible response to such images is to confront our own “lack of political freedom.” But such a response is blunted by the image—the endless crush of content; the endless consumption of despair that does little to address the political circumstances that create such images. Calls for gun control will be met with resistance, with arguments about freedom or the assertation of some fundamental right. ﻿The shooter’s history of violence will be minimized with the narrative of mental health. 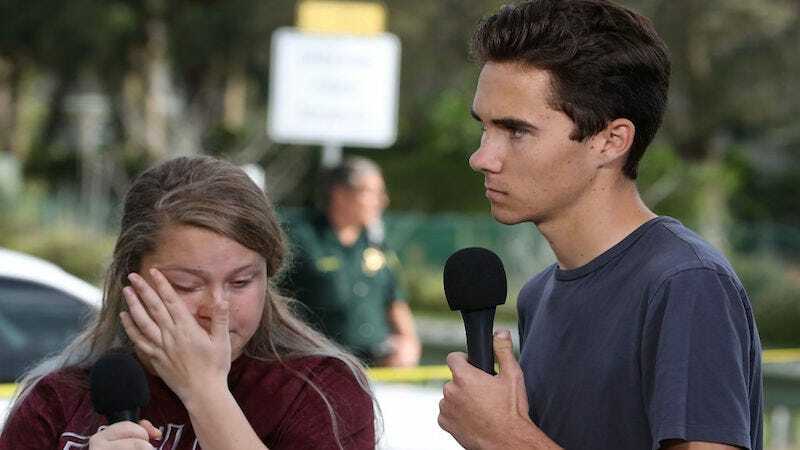 The shooter’s history of violence including, the Associated Press reports, his expulsion from Douglas after a fight with his ex-girlfriend’s new boyfriend, will be minimized with the narrative of mental health. So will the report that the shooter had trained with the Republic of Florida, a white supremacist group whose mission is to establish a “white-ethnostate.” “So many signs that the Florida shooter was mentally disturbed,” the president tweeted on Thursday, nearly mimicking his comments after the mass shooting in Sutherland Springs, Texas. Such closure is neat—it implies that neither policies nor cultures are responsible. Instead, it absolves everyone, including the shooter. The reproduction of a teenager’s photograph, the replay of videos from inside the school, will not rupture that quick narrative closure. It will not, as Berger argued, force us to confront our complicity in such policies or our own “lack of political freedom” within their continuation. Instead, they transform everything into content; violence is repurposed and reproduced for the purposes of affect. The images might make us feel our “despair or indignation,” but their use as content, as some kind of experienced reality—spectacular and fictional—works only to negate meaningful action.